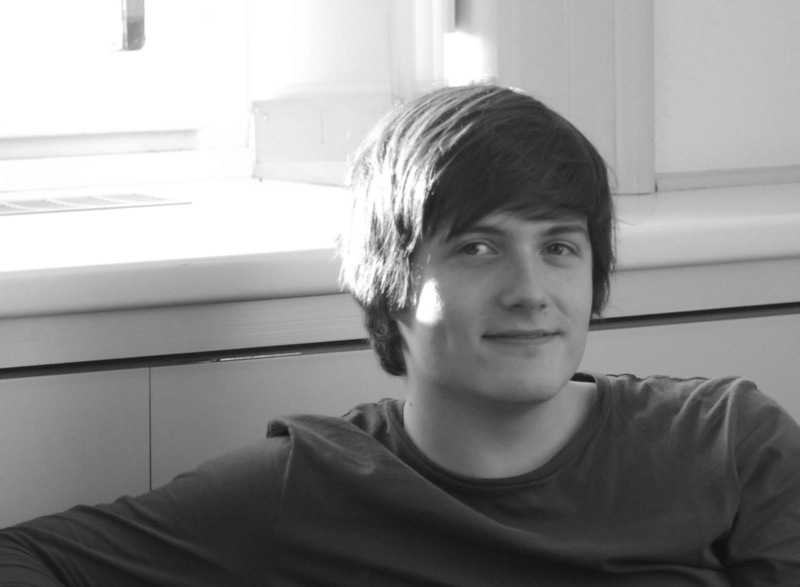 Writing for the Amsterdam stage, David Lingelbach (b. 1641)—himself the son of a German expatriate and artist—published a play entitled The Converted Alchemist, or: The Betrayed Fraud in 1680. 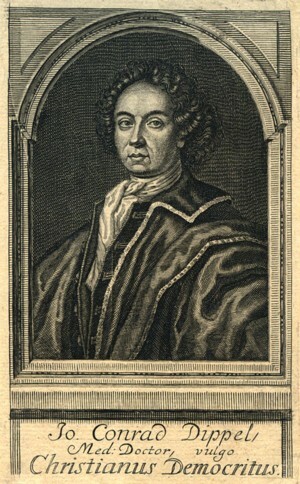 It is but one out of eleven plays he wrote under the banner of Nil Volentibus Arduum (‘Nothing is arduous for the willing’), a literary society active between 1669 and 1687 to spread the ideals of French classicist theatre in the Low Countries and otherwise known primarily for lack of talent. 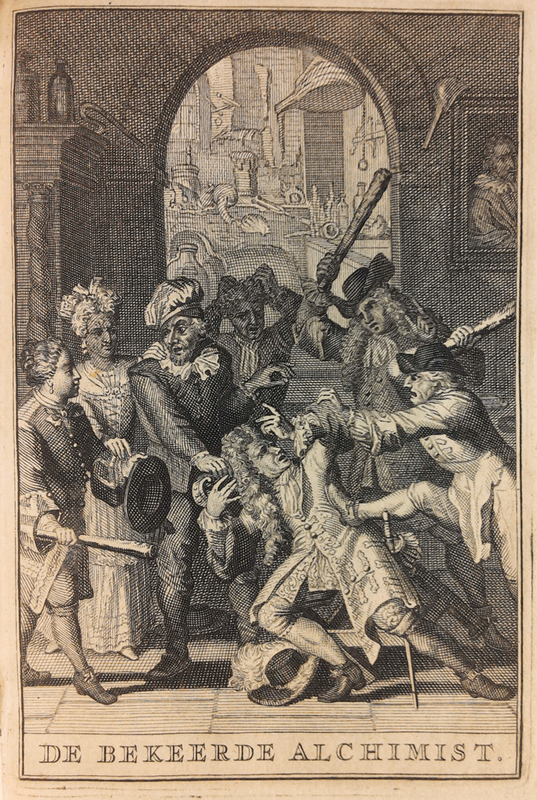 Thirty-four years later (1714), the self-appointed literary heir to Nil Volentibus Arduum, Ysbrand Vincent (d. 1718), published an improved, second edition that added greater poignancy to an intriguing intercultural encounter less explicit in the original printing: it tells the story of a Dutch widower, Govert, ‘naïve and unskilled in alchemy’, and his encounter with Squire Goudschalk (literally, ‘gold jester’), ‘a German, fraud and pretended alchemist of great experience’. And by the same token it provides us with a glimpse of some associations alchemy carried in early eighteenth-century Amsterdam. While not exactly on a par with Molière (d. 1673), The Converted Alchemist (1680/1714) is a brief, entertaining comedy that culminates in a sound beating for the fraudulent German alchemist. In the background, a well-stocked alchemical laboratory can be seen. Author’s photograph; courtesy of University of Amsterdam, Special Collections (OTM: O 63-5575). The gypsy lady astrologer from Alexandria in Egypt, Sibylla Ptolomaein, shows the tools of her trade, including celestial globe and sextant, and its products: a nativity chart (also known as horoscope) and symbols commonly used in astrological calendars. © Stadtverwaltung Altenburg, Stadtarchiv Historische Haus- und Schreibkalender. 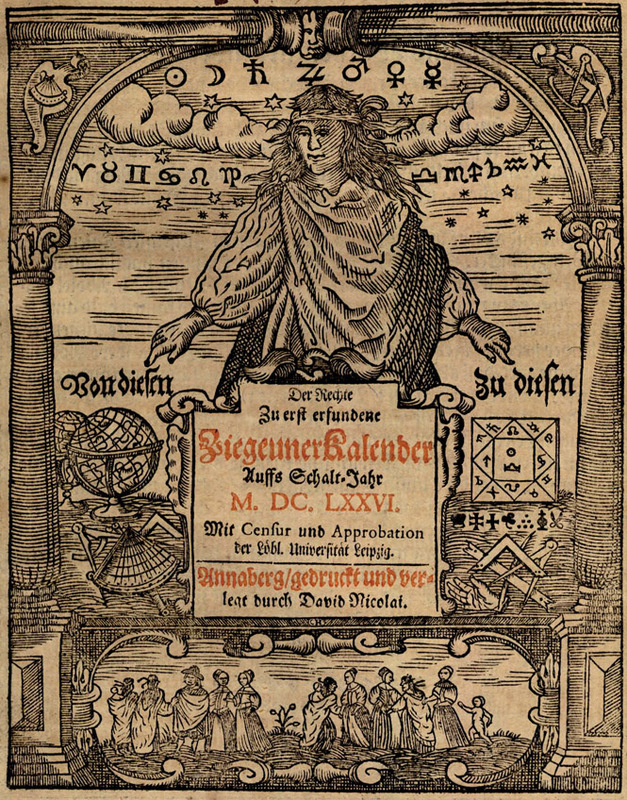 As the last quarter of the seventeenth century began, the astrological calendar-printing scene in Germany saw the sudden appearance of not just one but four Egyptian interpreters of the stars. (Actually, one of them claimed to be Persian instead.) Though usually published in large print-runs of several thousands, these almanacs with forecasts on the weather, politics, economy, family matters, good days for blood-letting or hair-cuts for the whole year were literally read to shreds (or put to other uses, some of them related to excrement) and so precious few of them have survived. The trade surrounding them was hugely competitive, hence crafty publishers picked their astrologer carefully. And even with a qualified expert, all things being equal, a little exotic lustre or mysterious scent could make all the difference in attracting the attention of the buying public at a loss to assess the respective merits of various calendars. An extraordinary authorial persona might well do the trick: meet, for instance, ‘Abdiel Bavai, presently astrologer in Alexandria, Egypt,’ or ‘Necho of Cairo in Egypt’. Most intriguingly, there was also a lady astrologer by the foreknowledgeable name of Sibylla Ptolomaein ‘from Alexandria in Egypt. 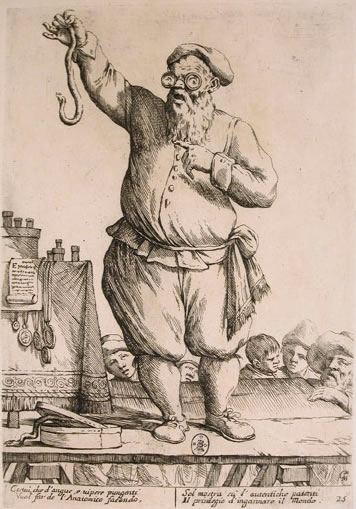 This Italian mountebank is depicted as impressing the audience with his snake-handling. As part of a description of the Medical Polity (1638) of his day, Ludwig von Hörnigk (1600–67) included a lengthy chapter on all sorts of shady figures that competed with university-educated physicians. Though the alphebetical ordering of the German is lost in translation, these included: ‘old hags, cut-purses, crystal gazers, village priests, hermits, bankrupters, jugglers, piss prophets, Jews, calf physicians, vagabonds, market criers, messengers, furnace enthusiasts, pseudo-Paracelsians, quacks, rat poisoners, speakers of blessings, conjurors of the devil, fiends, forest gnomes, gypsies, etc.’ (Hörnigk, Politia medica, title page.) Sounds random? A portrait of the blogger as a young man. By way of a blissfully short introduction, my name is Mike A. Zuber and I’m a PhD candidate at the University of Amsterdam. (For the record, Mike happens to be my actual given name as stated in all official documents, so please don’t call me Michael.) My research project is concerned with what I’ve tentatively called ‘theosophical chymistry’ in the early eighteenth century, particularly in German-speaking contexts. If you’d like to find out more about my research and academic activities, you’re welcome to stop by at Academia.edu.